The Review Data and Export tab allows you to review the results of the query, sort and filter using the grid, and ultimately export the data to Excel. You can also schedule the report to be delivered by email on a regular basis. One of the most significant tools are the filters. Apply additional filters to the grid to further enhance your query and fine tune your data selection. 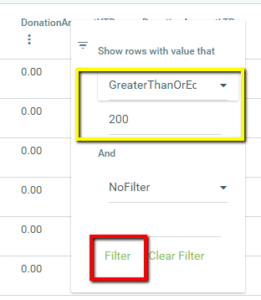 Type your filter in the text box (such as 200), click the filter drop-down to select “Greater Than or Equal To” – or whatever your filter is. Just like every other grid in DonorSnap, click the column heading to sort by that field. Clicking a second time will reverse the sort order. You can apply multiple levels of sorting by clicking on multiple field headings in the order that you would like the sort to take place. The second selection control is to specifically omit certain records. You can un-check the box to the left of any specific record to signify that you do not wish for that item to be included in the final export. (Remember to save the page if you’ve changed any of the specific selections before you navigate to another page in the grid). To clear all your queries or sorts, click the appropriate “Clear Filters” or “Clear Sort” buttons. If you ever have an issue exporting the results, try clicking both of these buttons and then save the changes. This fixes most problems on this page. Click the button in the upper right “Export to Excel” to download a spreadsheet of the data. Make sure you click the Save Changes button first if you have added any sorting/filtering/unchecking. Have the report delivered to your email inbox on a regular basis by clicking the “Schedule Email Report” button to the right of the Export button. Choose a one-time, daily, weekly, monthly, or quarterly email schedule. The results of the report will be updated each time the email is sent giving you the most current view of your data. Reports can be scheduled for up to two years at a time.